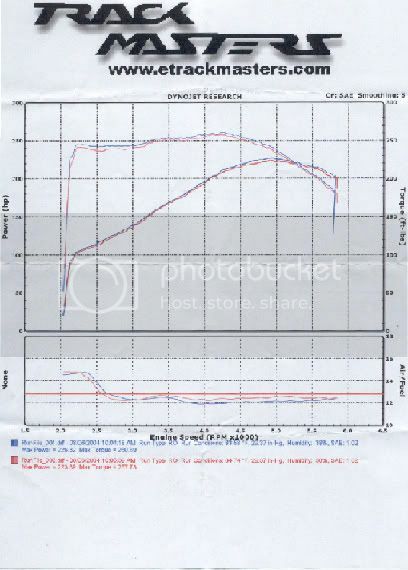 Here is the my actually dyno graph. Let me know what you guys think. Anything jumps our at you as being different? Any ideas on why my torque is at 260 when I was expecting it to be in the 270 range? looks about right to me thats the stock power band. How consistent would his stock reading be with mine ('02 GT, 5 speed, stock)? What I am trying to say is I would like to be a tightwad and NOT baseline mine. It's like $60 a run isn't it? I was thinking about just using standard stock numbers for baseline and do the dynojet after all of my mods. Would that be accurate? Looks right. I wish I had mine done also. There was a guy in line before me with a stock one and he did like 230 ho also. He stuck around to see what I pulled with my mods and I got 276 hp and 325RWTQ.